The Black Shark or Black Sharkminnow is a member of the cyprinidae family of fishes (carp family) which is a native freshwater species found in the Mekong and Chaophraya basins in Thailand. The Black Shark is also found in the Malay peninsula, Sumatra and Borneo. This Thai carp species favours canals, rivers, streams and inundated floodplains and feeds on a varied diet of algae, periphyton, phytoplankton and detritus. The Black Shark or Black Shark minnow is an easily distinguishable Asian carp species which displays a grey to blue colouration throughout its heavily scaled flanks which are topped by one iridescent spot on each scale. Two small pairs of sensory barbels are located on the upper lip of the carp as is common with many other carp species. Black Shark Carp are equipped with large dorsal and pelvic fins which coupled with a large tail allow the Black Shark to navigate the wild waters that it inhabits. Black Shark migrate upstream in the onset of the wet season where they spawn upstream of shallow sand bars. On hatching the fry move into bankside grasses in inundated floodplains moving further inland as the flood waters move inland. Black Shark are present in various reservoirs throughout Thailand such as Khao Laem Dam and Srinakarin Dam in addition to various Thailand fishing lakes such as IT Lake Monsters and Palm Tree Lagoon. 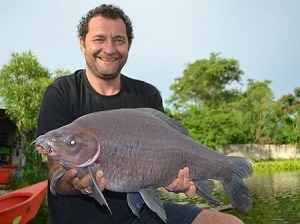 Thailand fishing for Black Shark is almost exclusively accomplished when using groundbait or lum presentations fished in conjunction with feeders on the bottom.